Very nice but thicker than I expected. It will be too warm for summer. It is attractive and looks very cozy on the bed. I was actually looking for a coverlet more than a quilt. I’m so pleased with this comforter. It is well made, thick and stylish. It truly would complement most decors. I’m using it in a guest room that has grey walls, whitish wooden flooring, silver silk window treatments and a bit of glam with velvet and silver accent pieces. This comforter adds a bit of cozy warmth and works very well with the look of the room even though this comforter IMO, is more of a “shabby chic” style. This is a versatile comforter set. This bedding was as described and my daughter who chose it for her room was very pleased. Our decorator was impressed with her selection. A bit pricey, so giving 4 stars rather than 5. The comforter set is nice but it is not bright white. 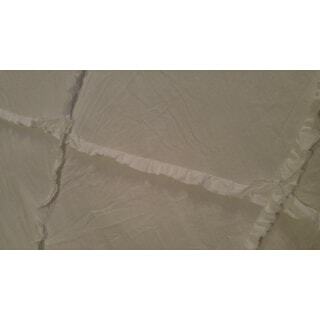 It is white, not cream, but it is a more off-white when compared to bright white curtains. The quality is decent for the price. The style is very nice. It is not high end bedding but it's decent quality. Love this! So beautiful! After seeing on a bloggers page i had to have it! The photos do not do this comforter set justice. Just beautiful. I love this and I have it on one of the beds in the bed and breakfast and it looks great. You can never go wrong with Laura Ashley as far as I am concerned. I haven’t washed it yet so I can’t comment on that. I gave it to my sister. Comfortable comforter Frill is cute I'm sorry. I attempted to upload a photo but failed with a small size. My wife often says that it’s the prettiest bed she has ever had and a agree fully. It’s very comfortable even in the summer time. Looks like good quality. Will see how it holds up after washing in the future. Gorgeous set. Looks gorgeous just like the photo. Love how warm it is and it makes the room look so classy and airy. Love this set. Washed it and it stayed intact. For the price, this is a steal. Ok for the price. Looks a little cheap. So cute. It looks great in my daughters room. The ruffles are not at all as pictured, the lay flat and lay to one side. We tried to iron it but it would have taken hours and the parts we did iron went back to laying to one side. Material feels a little on the cheap side as well. Looks great in my master. So pretty and soft. Beautiful well made bedding. Very pretty. "Does this pattern come in a cream color?"